Project Summary Information (PSI) Report No: 000051 Project Name Egypt Round II Solar PV Feed-in Tariffs Programme: TAQA Arabia for Solar Energy Country Arab Republic of Egypt Sector Energy Solar Photovoltaic (PV) Power Project No 000051 Sponsors TAQA Arabia S.A.E. Borrower TAQA Arabia for Solar Energy S.A.E. Environmental and Social Category Category B Date of PSI prepared or updated 03 August 2017 Estimated Date of Board Consideration September 2017 Date of Concept Approval 30 May 2017 Date of Final Investment Decision 27 July 2017 I. Introduction Egypt has among the best solar resources in the world. The Government of Egypt (GoE) has demonstrated a strong commitment to the development of renewable energy (RE), both at the policy and strategic level, through the adoption of ambitious and specific targets, and at the detailed implementation level, through the development of a detailed contractual and regulatory framework. The GoE’s Sustainable Energy Strategy 2035 confirmed the country’s target of reaching 20% of electricity generation from renewable sources by 2022. The importance of RE in reducing Egypt's greenhouse gas (GHG) emissions is also emphasized in Egypt's Nationally Determined Contribution (NDC) as part of the five key strategic policies for tackling climate change mitigation. The first round of a Feed-in Tariffs (FiT) scheme for RE organized by the GoE ended in October 2016. In September 2016, the GoE authorized a second round (Round 2) of the FiT scheme, targeting a total of 1.3GWac solar photovoltaic (PV), split among 20MWac, 30MWac and 50MWac projects, all to be located in the Benban Solar Park near Aswan. The deadline for the developers to reach financial close is October 29, 2017. II. Project Objectives and Expected Results The objectives of the Project are to (i) increase Egypt’s generation capacity by exploiting its vast RE potential and help the country to meet its power demand; and (ii) reduce the dependence on gas and fuel for electricity generation and move to a more balanced and environmentally sustainable energy mix. The Project results will be measured by the following key indicators: (i) number of MWac installed; (ii) number of residential customers that will benefit from the electricity supplied by the Project; and (iii) GHG emissions avoided on an annual basis (tons of CO2 per year). III. Project Description The Project entails the development, financing, construction, testing, commissioning, operation and maintenance of a 50MWac solar PV power plant located in Benban Solar Park. All output generated by the Project will be sold to the Egyptian Electricity Transmission Company (EETC) under a 25-year Power Purchase Agreement. 2 The Project is being developed by TAQA Arabia for Solar Energy S.A.E. (the Borrower), a special purpose vehicle owned 100% by TAQA Arabia S.A.E. (100%), the Sponsor. The Project will be co-financed by the International Finance Corporation and other lenders. The summary of investment information of the IFC can be found in the following link: https://disclosures.ifc.org/#/projectDetail/SII/37637 IV. Environmental and Social The Bank has decided to apply IFC’s Policy on Environmental and Social Sustainability, including the relevant Performance Standards (PSs), to the Project because: (i) it is consistent with the Bank’s Articles of Agreement and materially consistent with the provisions of the Bank’s Environmental and Social Policy (ESP) and relevant Environmental and Social Standards; and (ii) the monitoring procedures that IFC has in place are appropriate for the Project. Under IFC’s Policy, the Project has been assigned Category B. Four IFC PSs are applicable to the Project: PS 1 – Assessment and Management of Environmental and Social Risks and Impacts; PS 2 – Labor and Working Conditions; PS 3 – Resource Efficiency and Pollution Prevention; and PS 4 – Community Health, Safety and Security. A Strategic Environmental and Social Assessment (SESA) for the entire Benban Solar Park was prepared for NREA with the support of the European Bank for Reconstruction and Development and disclosed in 2016. The Bank has carried out its own due diligence, including review of environmental and social risks and impacts of the Project. The environmental, social, health and safety (ESHS) risks and impacts associated with the Project are limited, generally project-specific and not irreversible, and can be addressed through the implementation of good international practice as provided in the Borrower’s Environmental and Social Action Plan. The Bank also found that simultaneous construction of multiple solar power plants at Benban could pose various ESHS risks, stemming from traffic and transportation, occupational health and safety, worker accommodation, labor management, waste management, security and the management of stakeholder expectations from local communities. These cumulative impacts will need to be addressed in an overall ESHS management and monitoring plan for the Benban Solar Park. A Facility Management Contractor (FMC) will be hired to develop and implement the overall ESHS plan and other measures recommended in the SESA and provide construction services in line with IFC PSs for the entire Benban Solar Park. A Community Grievance Redress Mechanism (GRM) for the Benban Solar Park will also be developed by the FMC, and the FMC will be responsible for responding to any grievances that are raised in relation to the site or individual developers. During preparation, public consultation and information disclosure were carried out, per national and IFC requirements. IFC has published the results on its website: https://disclosures.ifc.org/#/projectDetail/ESRS/37637 3 V. Estimated Project Cost and Financing Source (US$ million) The Project cost is up to US$70-75 million. The Bank is considering a senior loan of up to US$17.5-19 million. The Project will be co-financed by IFC and other lenders for up to US$41 million, and the balance will be covered by equity. Xi Jinping : The Belt and Road Initiative is not a tool to advance any geopolitical agenda, but a platform for practical cooperation. It is not a foreign aid scheme, but an initiative for interconnected development which calls for extensive consultation, joint contribution and shared benefits. I am convinced that the Belt and Road Initiative will serve as a new platform for all countries to achieve win-win cooperation." A world threatened with the present danger of nuclear war, as newly accentuated by North Korea's sixth nuclear weapon test this weekend, and with economic devastation wrought by failure to invest in needed infrastructure and scientific advance, as in Texas and the entire Gulf Coast, would do well to rivet its attention on the Sept. 3-5 BRICS Summit, which has begun in Xiamen, China. Chinese President Xi Jinping, the summit's host, stated that "peace and development," and not "conflict and confrontation," are the policies the planet needs. 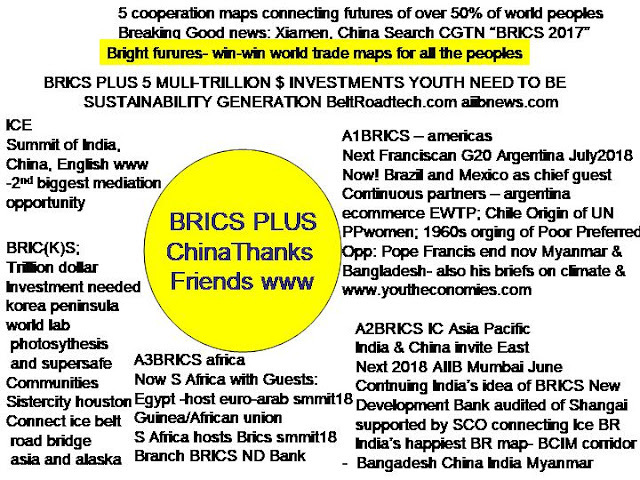 Jul 12, 2016 - BRICS bank to issue $448 million of yuan green bonds ... plans to sell 3 billion yuan($448.37 million) of yuan-denominated, green bonds in ..
Liaoning: reignite the competitiveness of northeast China’s traditional industries consequently opening up new sectors for foreign investment. Zhejiang: improve the construction of Zhoushan Free Trade Port as well as encourage commodity trade liberalisation. Henan: establish a modern three dimensional traffic system and modern logistics system meaning Henan will become a key location along China’s ‘One Belt One Road’ connection. Hubei: hub for high-tech industrial bases focussing on the Yangtze River Economic Belt. Sichuan: gateway to China’s western inland areas. Shaanxi: facilitate the construction of the ‘One Belt One Road’ network. Chongqing: strategic position in enabling access to the west of China facilitating the region’s overall future development. Shanghai, in August 2013, was the first city to be given the opportunity to trial a free trade zone; with fewer restrictions it was hoped that it would bring more foreign investment into China and take the focus away from Hong Kong, where the government has less control. Focus: international trade, financial services. Tianjin is a major city only located 30 minutes south of Beijing. It has a harbor and a well developed industrial sector. However, the major reason that the Central Government chose Tianjin is for a future purpose: Jingjinji, also known as Beijing-Tianjin-Hebei. This region is emerging as the major northern metropolitan area, rivaling the Pearl River Delta and the Yangtze River Delta. It is the wish of the Government to combine these cities in terms of infrastructure, manufacturing / industry and R&D resources. For that reason, a huge airport in the center of Jingjinji has been planned: Beijing Daxing International Airport. Also, it is the only FTZ zone in Northern China. This will boost Tianjin’s in the China-Mongolia-Russia economic corridor. Focus: Shipping, financial leasing and high-end manufacturing. Guangdong has a distinct advantage: the geographic location. It has several major ports and is the Chinese gateway to both Hong Kong and Macau. China is pushing for the 21th century (maritime) silk road, and both Shanghai and Guangdong fit the start of this route perfectly. Guangdong is a leading industrial province, with a huge electronic R&D sector in Shenzhen. Consequently, has been on top of GDP ranking of Chinese provinces for two decades. Moreover, this FTZ works on further integration of Mainland China with Hong Kong and Macau and exporting the huge number of products that has been produced in Southern China. Also, its purpose is to build a new financial cooperation system in the region. Focus: Finance industry, customs clearance and maritime routes to Africa and Europe. The Fuijan FTZ is located next to Xiamen, and will yield a lot of benefits linking to Taiwan. Nowadays, Fujian and Taiwan’s economies are very linked, resulting in a lot of economic interaction. It will promote free-flow of goods between Taiwan and Mainland China. Consequently, many benefits are for Taiwan entities. Examples are easier visa’s, encouraged construction projects and providing foreign bookkeeping services. Furthermore, Fujian’s rich land and labor resources have a great advantage to labor intensive industries. Fujian’s specification is to create easy entry barriers to attract more Taiwanese companies. Its dual channel of loan business for both sides is also a special advantage for Xiamen. Focus: Trade with Taiwan, production services and high-end service sector. Special Olympics serves 2.5 million people in over 180 countries. For more information, go to www.specialolympics.org. Four modern innovations that started in China but are making an impact on the rest of the world: 1. mobile payments 2. Mexican berry growers are taking advantage of new trade protocols signed recently, and China is part of the deal. What is the next big trend? Amazon China President Doug Gurr said it should be cross-border ecommerce. Watch the interview to ..